This little building is a survivor! You may recognise it as the small house opposite the end of Church St. just down from the Coop. It is very old – probably 200 years or maybe more and has had an interesting life. In this month’s photo, probably in the 1920’s we see two shopkeepers standing outside their businesses. On the left a barber and on the right a cobbler. The sign says “B.Conquest, Boot and Shoe Maker” and there seem to be sheets of leather on the floor in front. 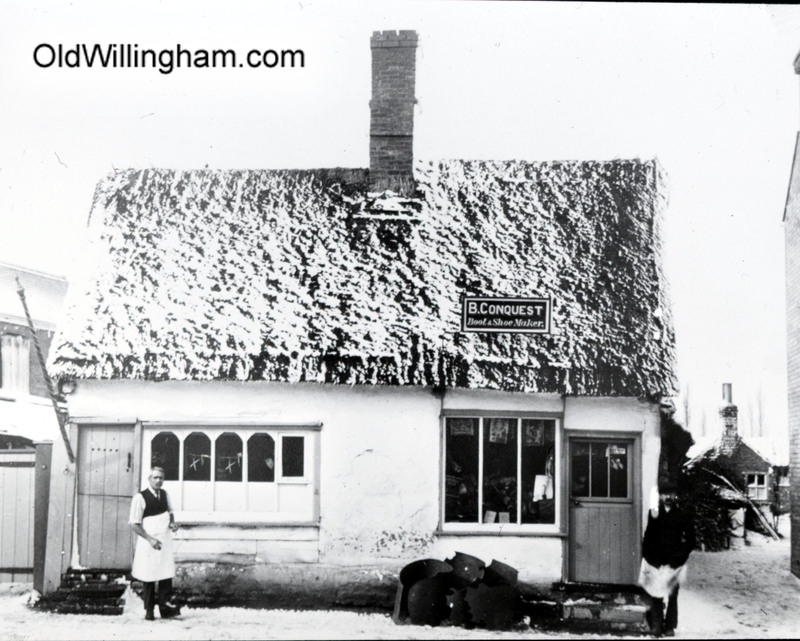 The right hand part was a barber in the 1950s by which time its thatch had been replaced by corrugated sheet and by the 1970’s it had almost disappeared, overgrown with ivy. More recently it has been nicely renovated. The thatch is back and, apart from losing the two doors, it is instantly recognisable. May it have many more years yet.